Certification5 Whereabouts at SAPPHIRENOW 2011. Orlando FL May 16th-18th 2011. Certification 5 are confirmed to take part of the first Certification Influencer Council (CIC) scheduled during SAPPHIRENOW in Orlando in May 2011. This is a step forward based on the dialogue established with SAP and partners. We look forward to debrief you in due time. 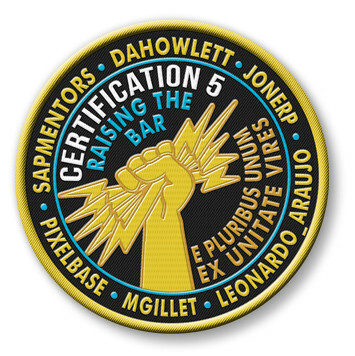 It was widely whispered that the C5 would release a new patch showing their strong believe and commitment in the work provided under a team effort. Latin motto such as E Pluribus unum (Out of many -sapmentors-, one (group) and Ex unitate vires (Out of unity is strength) have been chosen amongst dozen to reflect that. Colors and layout were inspired by this great journey of space adventure and more especially the Apollo 11 mission (source courtesy NASA). We do hope you have noticed @Certification5 is doing the needful since 2009 to further engage on this passionate SAP Certification topic. Background healthy readings should you want to chime in.